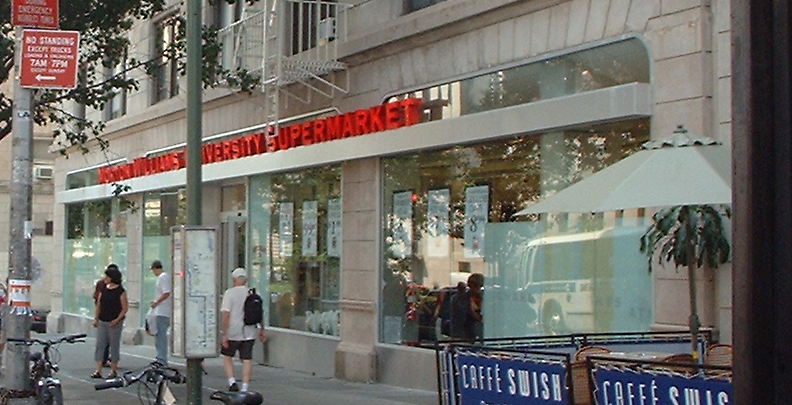 October 31, 2003: The University Food Market (formerly Ta-Kome deli) closes after 46 years. Photo: Steve Jensen, 1985; CLICK for detail A deli of some sort has had the corner spot on this block since who knows when. About 1957 whatever deli was there at the time (name?) was purchased by the family of the present owner, Charlie Pastor, and called Ta-Kome, "Home of the Hero" (left). Until 1986 it was a single-width establishment, only 25 feet wide, one of the most crowded spots in town. To its right was Salter's, a huge, ancient, cavernous, dusty book store specializing in Columbia course and/or used books (they'd sell you a new book for $30 and buy it back the next day for ten cents, and sell it the next for $29.95). (And to Salters' right, for a couple years, was Ta-Kome II, a Ta-Kome satellite that sold takeout hamburgers and french fries). 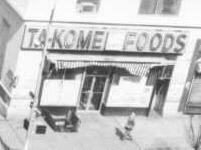 When the Salters finally retired about 1985, Ta-Kome got the space, expanded to fill half the block, and renamed itself University Food Market (UFM), since now it was indeed a supermarket as well as a deli. Instead of one cash register there were six, plus aisles and counters galore, and about 40 new jobs were created. UFM is the primary source of calories for the neighborhood and still one of the most crowded spots in town, especially since absorbing the legacy of Mama Joy's (a long-lived Italian deli just down the street, closed in 2001 after more than 50 years), and even more while D'Agostino's supermarket on 110th Street was closed for a year in 2002 for construction of "The School". 17 September 2003: UFM announced it will close after almost 50 years on November 1st, and will reopen under new management. About 50 people work there; as of this writing, their future is uncertain. November 12th. The lead article in today's Spectator is Low Wages Force Some UFM Employees to Quit. I had a discussion with Morton Sloan, the new co-owner. He said that some wages were "artificially high" and needed to be adjusted to market rates for fairness with his other stores. The new wages typically run below $10.00 an hour. Most cashiers are making between $5.50 and $7.50 per hour. $7.00 an hour is $12,000 a year. $10.00 an hour (the high end of the non-managerial wage scale at the new UFM) is still only $18,000 a year (this was offered, for example, to a counterman with 27 years seniority, supporting a family with three teenage children). Poverty is defined as an income below $18,400 for a family of four or $15,260 for a family of three (2003, nationwide). The cost of living in NYC is more than 3.5 times the US average. The new wage scales might be "fair" and "good business practice" in today's economy, but they are not living wages, especially for single parents. New York City minimum wage, by the way, is $5.15. NYC Public Advocate Betsy Gotbaum says, "a minimum-wage earner would have to work 154 hours every week to afford a two-bedroom unit at fair market rent" (see Links below). Morton Williams should be credited for keeping so many of the original UFM people on rather than firing them; for having a union shop; for remodeling with the store open rather than closing it for three months; and for employing (according to Sloan) 90% minorities (primarily Hispanic) in its stores. MW should be encouraged, however, to consider the cost of living and raising children in New York City when determining what is a fair wage, and also to include seniority in the calculation -- 10, 20, or 30 years of loyal service is worth something. Similarly for scheduling: UFM's working parents need to be able to drop their kids off at school or day care in the morning and pick them up after work on a predictable basis, just like any other working parents. The previous owners were able to run the store with more employees and higher wages and still make a profit. Happy workers are good business. Let's hope Morton Williams succeeds in its new location. The neighborhood needs a good and affordable food market, and the employees need their jobs. Morton Williams has every prospect for success, due to its prime location and the impending shutdown of its main competitor in the neighborhood, West Side Market (85 more jobs lost). Share the wealth with the workers who make it possible! Salaries remain low, but schedules are settling down and there have been some promotions. The store is now open 24 hours, which means there must also be a shift's worth of new jobs. These are signs of progress. I discovered that there has been an ongoing discussion of UFM on the Yahoo MHNET group (follow the link and then search for "university food market"). Most postings echo the sentiment that the UFM people have been like family all these years, that the layoffs and salary cuts have not been a good way for Morton Williams to introduce itself to the neighborhood, and that the mood in the store since the turnover ranges from "bad vibes" to "shell-shocked" to "grim". I don't think Morton Williams appreciated how visible, well-known, and well-liked the UFM people were among the customer base it has inherited. Ed Kent wrote of the new arrangements dividing "those of us who have got it made in the neighborhood from those who labor at poverty level wages on our behalf. It will be difficult to chat about our respective kids and how they are doing in school or whatever. I imagine being on one's feet for many hours behind a cash register must leave one pretty weary over a long stretch... I don't mind slightly higher prices, but I will object most strenously to bad treatment of our staff friends." 18 November - 7 December: No heat in store for three weeks. 25 November 2003 Spectator article: UFM Adds Amenities Under New Ownership But many area residents remain unhappy with the store's labor practices. 8 December 2003. RKF Secures 6,200-SF Corner Location on Broadway for Morton Williams Supermarkets (Robert K. Futterman & Associates, Inc, press release). "Principals of [Morton Williams] include Columbia University alumni who understand the community and have a vision of what the corner location could become." 10 December 2003. I spoke with Avi Kaner, VP of Morton Williams, who said (regarding the increases that were promised after the first month but had not yet materialized), "They [the employees] will immediately receive the appropriate raises." He also says that the store now employs more people than it did prior to changing hands. The raise was 25¢ and it first appeared on December 24th; it comes to $9.50 per 38-hour week. 29 December 2003. Julio (deli counter, 9 years) promoted to manager and sent to the 59th Street branch. The "Julio Special" remains behind on the sandwich menu. 15 January 2004: Armando, former deli manager (and previously at Mama Joy's), appointed assistant store manager. 17 January 2004: The Good News: Space heaters were installed in two of the six checkout counters, and a veteran cashier (Ritha) was promoted to assistant manager. The Bad News: José Jiménez, beloved night manager of Ta-Kome and UFM for 37 years, quit in disgust after having his salary slashed, then being transferred from the store he loved to another branch and put to work mopping floors -- a sad day for customers and his fellow workers alike. A customer writes, "...on my parting hug he told me that he had tried and tried but that he just couldn't take it anymore and he had finally quit... i then saw him walk out for good. we'll never see him again. so the nice manager who was always so friendly and helpful is gone! he always told me that after his many years there that we his customers were his family. what a loss to the community!" 19-20 January 2004: The scaffolding in front of the store (which has been up since long before the transfer of ownership) was taken down, which means renovation of the storefront will begin soon. It was from this building -- 601 West 115th Street -- that a chunk of masonry fell in May 1979, killing a Barnard College student; this was the origin of NYC Local Laws 10 (1980) and 11 (1998), which require inspection of the façade of every residential building over six stories tall every four (or five) years; hence the scaffolding on this building and thousands of others all over the city ever since. 21 January 2004: Storefront renovations commence. A plywood shelter is being constructed over the north bank of windows (where the new cash registers are being installed) which should provide some shelter when the window glass comes out. 26 January 2004, 8:00am. More windows coming out, 14°F. New York State Consolidated Law, Chapter 31 ("Labor Law"), Article 14 ("Mercantile and Other Establishments"), Title 1 ("Sanitation"), §382 ("Ventilation, temperature and humidity"), states "Every mercantile establishment and every restaurant shall be provided with proper and sufficient means of ventilation by natural or mechanical means or both, as may be necessary, and there shall be maintained therein proper and sufficient ventilation and proper degrees of temperature and humidity at all times during working hours." Consult the temperature chart above; note that the average high for the period is below freezing (and only a fraction of a degree above the average low for January) and that the outside temperature is approximately equal to the inside temperature, especially at the checkout counters. Apparently management is now making an effort to route more power to the counters for the space heaters, but this is taking some time. Remodeling with the store open for business is far preferable to closing the store and furloughing the workers but shouldn't temporary heating have been part of the plan from the beginning? 29 January 2004, 8:00am, 21°F. More windows being replaced; cold wind blowing through the deli area, still no heat. Most of the cashiers now have working space heaters, but the new (temporary?) entrance/exit door by the cashiers has no air lock or shield, and a cold wind comes in every time the door opens. Meanwhile, most of the old shelving and cabinetry is being replaced and rearranged throughout the store (this has been an ongoing process but moved into high gear in recent days). The produce section has been moved to the front windows (where the cashiers were) and almost everything else has moved too, except the deli counter and the aisle closest to it. 30 January 2004, 8:00am, 15°F. All the cashiers have at least one working space heater, some have two. Good! (But the rest of the store is still cold.) Reorganization of the interior space continues and new floor tiling is being installed. 1 February 2004. The Local 338 union contract starts today. CLICK HERE to read the contract (PDF format, about 2.5MB). 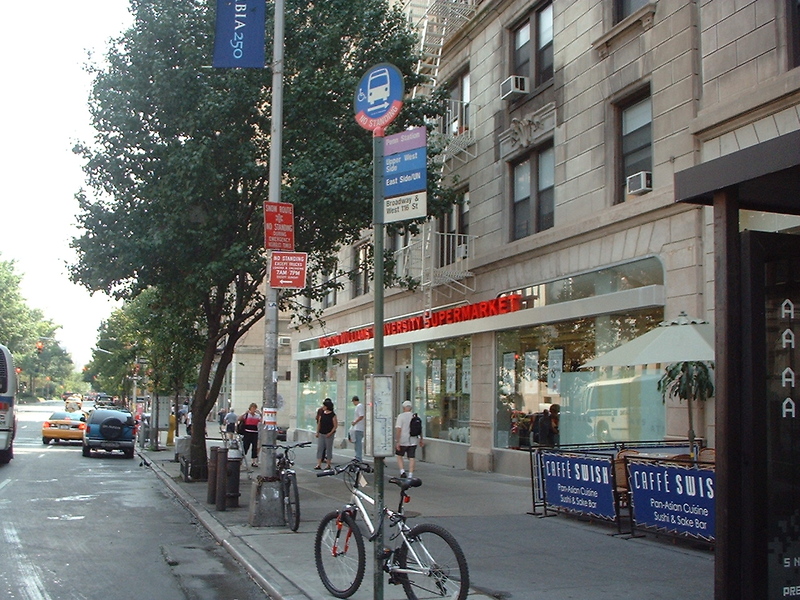 CLICK HERE to view a comparison table of the Local 338 contract with other union contracts covering similar work forces (such as cashiers and cafeteria workers) across the street at Columbia. 2 February 2004. Columbia Spectator : "Morton Williams Disappoints Employees, Satisfies Customers" (Scan/PDF) (Searchable/PDF): "Since Morton Williams Associated Market purchased UFM, 23 of the original 45 employees have left. The store claims it is trying to improve the shopping experience for Morningside residents, but many residents are increasingly vocal in their opposition to Morton Williams' treatment of its employees." The article goes on to allege a systematic pattern of pay cuts, schedule changes, transfers, and mistreatment whose effect (I won't speculate about motive) has been to encourage "overpaid" employees -- those with years of seniority -- to resign so they can be replaced by lower-paid ones. 9 February 2004. Columbia Spectator : "Debates Continue On Store's Policies", focusing mainly on Local 338. 10 February 2004. Columbia Spectator : Letters to the Editor regarding Morton Williams UFM. 13 February 2004. The second 25¢ installment of the promised 50¢ raise takes effect this week. 19 February 2004. Columbia Spectator : "Supermarket Scandals" (Opinion) "Veteran workers' salaries were slashed -- sometimes by as much as 70 percent -- and many were transferred to other Morton Williams stores in the city and assigned menial tasks. … Somebody should have checked Morton Williams' wage-slashing exploits; that somebody is Local 338 … And although the union vehemently rejects this assessment, 338, quite simply, hasn't been doing its job. … The starting hourly wage for a cashier at Morton Williams University Market (as the store is now known) is about $6. That comes to $12,000 a year. You show me how to live on $12,000 in this city, let alone raise a family… Why didn't Columbia demand that MWUM pay a living wage? … Columbia Human Resources recently posted an ad for part-time cashiers … at $15-$17 an hour. If the University believes such work is worth $17 on one side of Broadway, how can it justify leasing to a company that pays one-third as much across the street?" (SEE TABLE). 26 February 2004. Columbia Spectator : "Morton Williams Defends Cuts". And my response (LOCAL COPY). What disturbs me about the tone of this discussion is how so many people seem to feel that the UFM workers are trying to put one over on "us" in their desire to earn a living wage, as if they don't deserve to have enough money to pay their rent or feed their children, no matter how hard or how long they have worked. But we're going in circles. Morton Williams says it has done nothing wrong; they bought a store and offered jobs to (most of) its employees at the going rates. The employees have done nothing wrong either; they worked for years and years at UFM until their wages became higher than the current sub-poverty "industry standard" set by Wal-Mart, to the extent that Morton Williams feels it can call their former salaries "unreasonable" and "outrageous". Long-time UFM customers, however, are appalled at what has happened to their friends on the UFM staff. UFM was one of the very few long-lived and stable businesses in the neighborhood -- 46 years at the same location. It must have been doing something right! Part of that something was making lifetime careers for good hard-working people, whom we came to know and love. To see them fired or their wages slashed after all these years was almost as much a slap in the face to us as it was to them. No wonder you don't find the same crowds of customers in the store as there were before. At UFM, we are seeing the new economy up close and it's not pretty. Of course other neighborhood stores deserve the same attention, but tend not to get it because few of them last very long and/or they have extremely high employee turnover and/or they are not the type of store you would visit 2-3 times a day. Indeed, Morton Williams does not deserve to be singled out in the new world of Duane Reades, Wal-Marts, and all the rest. But for Columbians it's hard to ignore what has happened at UFM because it's in the family. If I have focussed unfairly on Morton Williams, I hope others will focus on other establishments until there is a consensus that all people who work deserve a living wage, and that companies deserve our business when they "Just Say No" to the Race to the Bottom. 24 March 2004. Columbia Spectator Letter to the Editor: "Morton Sloan Owes Grocery Workers Respect and a Living Wage". 26 March 2004. 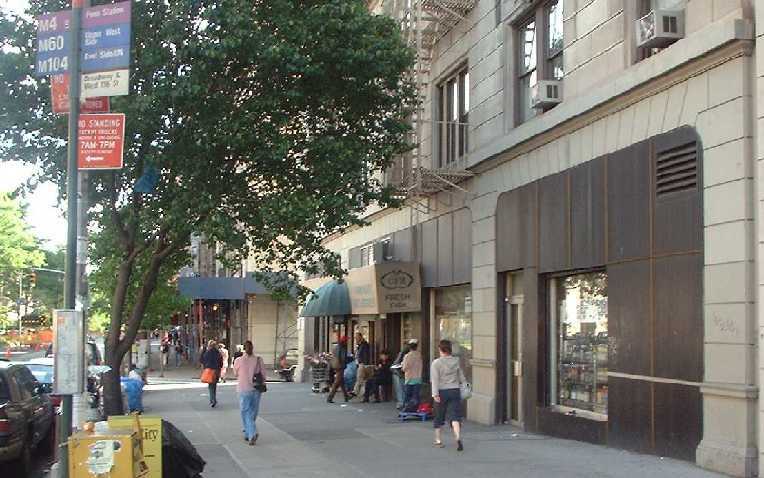 Columbia Spectator Staff Editorial: Welcome to the Neighborhood - Morton Williams' worker practices are not acceptable here, concludes with "Morton Williams needs to change its ways, or Morningside Heights needs to take its money elsewhere." This stops just short of calling for a boycott that would probably hurt the employees as much, if not more, than MW. All former UFM employees (except a few) got a very raw deal and most of them are now gone, many of those still out of work. MW should find a way to make amends. As the editorial points out, this is a community that respects and rewards socially responsible businesses. 15 June 2006. Charlie Pastor, of Mamaroneck, NY, died at New York Presbyterian Hospital in Manhattan, almost 50 years after he opened the Ta-Kome deli on the corner. I always loved his store; it had a special place in my heart, like family, magical things happened there. Everybody loved and respected Charlie and wishes he had never left. Photo: Frank da Cruz, July 2004. CLICK for larger view. University Foods (UFM sketches by Bob Taylor of Columbia Teachers College). NY State Labor Law Article 14, Title 1. US Civil Rights Act of 1964, Title VII. US Equal Employment Opportunity Commission Overview. Down and Out in Discount America , Liza Featherstone, The Nation .